The Church of St. Parasceva in Botiza. It is said that when in Vişeul de Jos, the tower was even higher than nowadays, although it seems that the same shape was maintained when rebuilding. To outsiders it might seem a pity that the old churches are no longer in everyday use, it has to be remembered that as the communities grow, the places of worship no longer accommodate all those wishing to attend the religious services. Without the new cathedral-size churches that only the biggest and most prosperous communities can afford to build, it is often only the men who can enter the church, and the women need to stand outside. 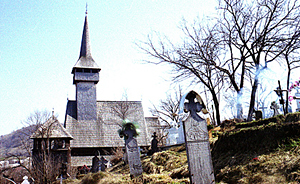 Besides the two churches, there is an old wooden belfry in the churchyard and a calvary cross protected by a carved structure. The calvary cross itself is made of tin, and painted in a realistic way. Painters known by name, Iuga Dionisie and his daughter Aurelia, repainted the interior walls after the church was dismantled, moved from Vişeu de Jos, and rebuilt. 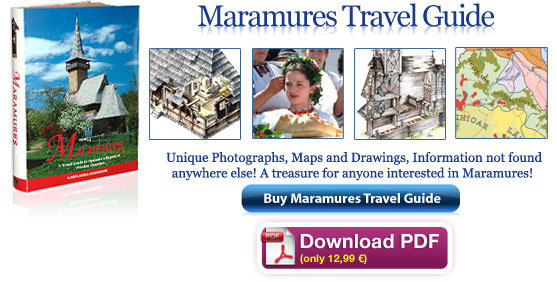 The scenes are very dark and not much visible, and mainly floral motifs are legible. Also the icons that form the iconostasis are darkened by smoke and age. The Church of St. Parasceva in Botiza seen from south and from southeast. The cemetery has some nice old wooden crosses and a belfry. 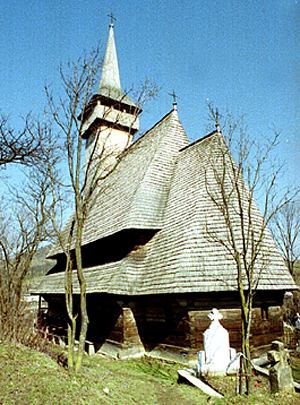 The wooden church dedicated to Parasceva is rectangular in plan, with a polygonal chancel apse, as is usual. The main body of the church includes the naos, with its barrel vault, the pronaos and the porch. The porch is bigger than usual, almost square in shape and with two entrances: one gate on the south side and another one on the north, but not on the west side as is usual. The roof with double eaves covers the main part of the church, while the chancel has a slightly lower roof. The tower is square, with a somewhat larger balcony on top, and a tall conical roof. 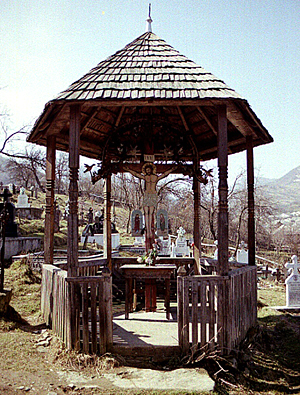 A Calvary cross in the cemetery, under a shelter, makes a small altar for offerings. The church has more windows than many of the other wooden churches. There are three windows in the chancel, one each on the north and south facades, and one in the middle of the east apse. Naos is lighted by windows on two levels, altogether twelve of them, those between the eaves being smaller than those at ground level. Pronaos has two windows both on the north façade and on the south one, when in many churches thre is only one on each façade. Compared with other churches, the church of Botiza is relatively well lighted. The entrance door to the church is intricately decorated. Around the doorframe goes a cable of twisted rope, carved with a much tighter twist than usually. Around this goes another wide band of rows of incised triangles and a total of ten round rosettes with incisions. This band is painted a violet blue. On the door itself are very faint remains of a painting, perhaps Christ with St. John the Baptist and the Holy Virgin, or perhaps with the patron of the church, the St. Parasceva.